all penalties need a handbell. I’ve had a post-it by my bedside for the past couple weeks, where I write down various things that pop into my head at night when I’m trying to go to sleep. Or when I’m trying to have my quiet time with God in the mornings. A quick note jotted down on the post-it, and I am free to resume sleeping, praying, or reading. This week I’ve been keeping track of the things that I wanted to blog about, which are: all my love, needing a penalty box, and handbells. Let’s start from the end and work our way through these completely unrelated topics. This is not my handbell choir. 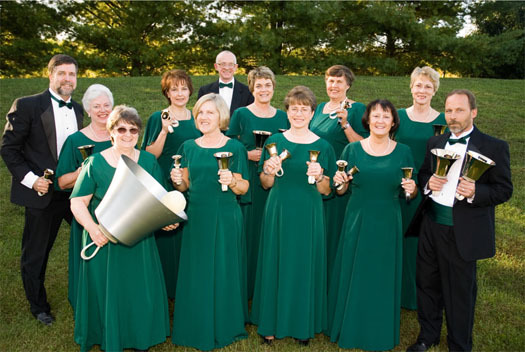 It’s the Warrenton Handbell Choir, whose picture conveniently came up when I searched, “handbell” on Google images. My handbell choir is just as good-looking however, even if our bells aren’t quite so big. We don’t wear matching green attire, but we do have theses really neat page lights that look like antennae. Each Wednesday at 8:50 pm, I walk into our church’s sanctuary, usually having already gotten ready for bed since I won’t get home til after ten. Dawn’s usually already at the table, getting her black gloves on when I come in. I wear no makeup, my retainers are already in, and my hair is usually the way I put it up to wash my face. But she always greets me as though it makes her day to see me. Then we muddle through our songs for an hour and sometimes crack jokes with my mom, who stands just one place away. and that, folks, is handbell choir. A relatively unique experience for an 18-year-old. I went to my first hockey game last week, which happened to be a Wild game where they won in a shootout. That happens like twice a season, I’m told by my hockey-savvy friend. Anyways, one of my favorite parts of the game was something similar to a timeout. Maybe you’re familiar with this, but let me narrate for you what happens. These big boys in lots of pads have quite a bit of drive to win, and they also may have some anger issues. So, when the guy on the other team is trying to shoot a goal or something, sometimes players have to get a little rough. And sometimes the refs don’t like that. So, they put the big boys with lots of pads in a box. Yes, a box. They put them in the penalty box and set the timer for a certain amount of minutes so these big boys can cool off and think about what they’ve done so they don’t overheat and melt the ice. And when I got home, I was thinking about how sometimes I really need that. I remember vividly being sent to my room when I was younger, where I would sit and cry for shame of getting sent to my room. Or I would fume and cry about being unfairly punished. Then, once I had become properly penitent, I would yell, “can I come out now?! ?” repeatedly until someone replied. I think I need self-inflicted timeouts, time in my own little penalty box. Or maybe I should just spent more time thinking before I speak or act. That may be more of my problem, my rapidity of speech. Either way, I liked the idea of sitting in a little glass box, where you can still see what’s going on, but you can’t affect it. You just are to sit and think about what you’ll do next. Maybe why you shouldn’t give other guys really hard shoves, or, in my case, why I shouldn’t say harsh things or be judgmental. Penalty boxes. Timeouts. The people who came up with those are to be commended. This week at night church, our worship leader recounted one of the most profound conversations I have ever heard in my whole life, one he had with his mentor about the verse in the Bible that says, “Love the Lord your God with all you heart, and all your mind and all your soul, and all your strength.” I’ve heard people talk about this before, but the simplicity and profound nature of this conversation just threw me for a loop and made me marvel one again at my God. mentor: what do you think the most important word in that verse is? mentor: I think it’s all. mentor: is your love perfect? mentor: isn’t it amazing that God wants all of it? This is the part where I step back mentally, drawing in a slow breath as I think about that again. I’ve heard time and time again in my Christian circles that God wants me, all of me, just as I am, because he loves me so much. Then I think about the way I love people, sometimes half-heartedly, sometimes with reservations, sometimes with irritations, sometimes without much commitment, sometimes not genuinely, but always imperfectly. Then I think about my love for God, though I love Him all the time, my love doesn’t always translate into action. And sometimes it gets a little cold or lukewarm, like that dish that you heat up in the microwave but forget about so it gets soggy and gross. And sometimes it looks like falling asleep while I’m talking to Him. But even through all of that, He doesn’t say, “oh you keep some of that. It’s a little ugly and not up to par with what I think I should get.” He doesn’t reject my affection or my devotion. He doesn’t tell me that I need to clean myself up before I try to love Him. He doesn’t demand that my weaknesses become obliterated before I try to serve Him. He just asks for all. Give me all. And my remaining thought is still, why?